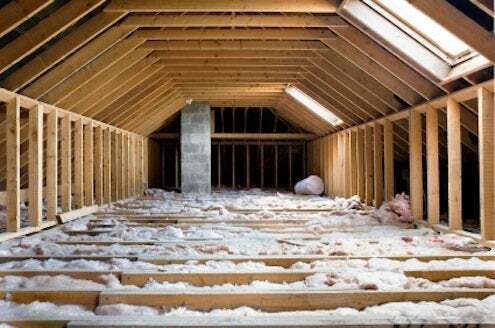 Whether you live in a hot or cold climate, the most important area to insulate is your attic floor. This fully insulated “buffer zone” will help keep heat where you want it and keep the lid on your energy costs. The basic principle of good insulation is that you want to keep heat energy from doing what it does best: escaping. The idea is to trap a layer of unmoving air next to the heat source, which in this case is your heated home. In new framing, sprayed-on polyurethane foam, fiberglass, or cellulose—or even recycled denim—do a good job trapping air in the wall cavity. If you’re retrofitting your insulation, you can still spray in cellulose through holes cut from the interior or the exterior. The R-value of insulation is the measure of its resistance to heat flow. The higher the value, the more effective it is. To see the recommended insulation R-values and cost estimates in your zip code, visit the department of energy’s web site, www.energy.gov.